A messenger ran ahead of them as Eruviel strode over the greying boardwalk in Aughaire. Arathier followed close behind, a stern expression replacing his attempt at a smile. She felt she same dread that flickered in his eyes. She had not been back in the five years since slaying Alagos. Her thumb played over the black leather string bound around her hilt. It was the only memento she had kept of that battle. That and the memories that still haunted her. Glancing over her shoulder to her tall companion she convinced herself that it was for the best Arathier not know. Not yet . . . maybe not ever. Approaching the hut set aside for the hunters, Eruviel ducked inside to face the small gathering of elders and aged fighters. The half-dozen men look up at her, their angered looks melting into ones of surprise and relief. Stunned, several seconds passed before he could manage,”I — I am Arathier. A Ranger of the North.” Bowing politely, Arathier shot Eruviel a bewildered look. Bowing to the room Eruviel glanced up at Arathier and she stepped out of the tent. The small hut on the edge of the village had not changed at all. Well, there were more weapons and tools scattered about than when it was her quarters, but Daran had always been messier than she. Stepping inside the empty hut she moved past the low bed, and a chair with folded men’s clothes on the seat, walking to a long, narrow table covered with weapons. “Take whatever you might need,” she said as she picked up a crossbow and a large pouch overflowing with iron bolts. I need to start remembering to tell him these things, she thought sullenly. Arathier had not hesitated to say he was going with her when the news about Daran had reached her in Bree. Strapping the crossbow to her back she shot him a half-smile. “A very old friend. He’s a half Dunedain, half Angmarim. I rescued him from a battle in Fasach Larran when he was a child,” she says quietly, her tone neutral. Twanging her bow string she frowned and replaced it. “He must be nearly a hundred and thirty,” she said thoughtfully. Guilt stabbed at her. She should have returned to visit. He was the only family she had left from before. The grey land flew past them as they ran. Sprinting through the dark, her dropping a distant warg and Arathier cutting down an orc scout that tried to evade them, the emptiness that had overwhelmed her began to fade. Running in step brought back the same comroderie she had felt with Eirikr on their way to . . . . NO, she told herself as they charged up the path towards the outpost. There has been too much loss. I will NOT loose Daran too. Arathier came to a stop beside her, cleaning the blood off of his newly acquired daggers. Eruviel stopped in her tracks, giving the him a hard look. “What is it, Bram?” she asked, her voice faltering. Eruviel’s emerald eyes faded to black as she walked towards the Ranger, thoughtlessly brushing aside Arathier’s hand as he moved to comfort her. “And no one has gone up there?” she growled, her hand moving to her sword hilt. She could feel it; the rage boiling up like a beast inside of her. Halting, Eruviel clenched her fists. “What did they do, throw rocks?” she spat under her breath. “I’ll get him down,” she said quietly, gracefully pivoting to head out of the camp. They raced over the dead earth, paving a path towards the dark towering citadel on the western slope of the mountain. In the darkness to her left she saw the line of hunters silently following, giving them cover. Motioning out to the closest man she cast her bow aside and pulled the crossbow from her back to load it. Arathier followed with a bit of effort as she led them down a narrow ravine to where a break in the wall stressed against the mountain side, a gap showing at the base. Eruviel slowed as she squeezed through the hole in the wall. Glancing to Arathier she nodded upward as she slung the crossbow onto her back. Jumping up to grab a hand-hold on the crudely patched stone wall, she began to climb. Arathier shouldered his bow, quickly following Eruviels handholds and steps. She could sense the anxiety that surrounded him. “You can still turn back, my friend,” she whispered down to him as they neared the top. “Never,” he replied in a fierce whisper. A wry smile curved up the corner of her mouth. About to reach for the upper ledge the sound of heavy footsteps warned her in time and the two of them hugged the cold stone as a pair of orcs lumbered past. Counting steps she then reached up and pulled herself onto the top of the wall. Rolling, she pushed up from the floor and dashed up behind the second orc, slitting it’s throat. Arathier followed, killing the other before it could turn. Running in a crouch to remain as hidden as possible by the shadow cast by the railing, Eruviel took the crossbow from her back and afforded herself a brief look into the darkness below the citadel. Having spent so many years with the hunters she knew where to find them as they fell into position. It seemed the older fighters still remembered how she worked. Speeding forward, they could see a wide balcony filled with Angmarim and orcs who half-encircled a tall pile of kindling, crowned by Daran bound to a stake. Fire sparked along the bottom edge of the dry wood, illuminating the man above. 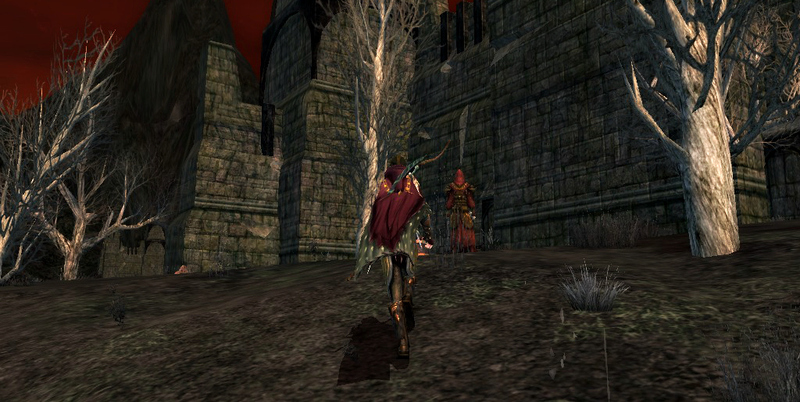 Sprinting forward Eruviel shouldered the crossbow, a greater focus taking hold as the anger within her swelled. Arathier followed her more slowly as he held his bow at the ready, nocking an arrow. A small glint shone out from the dark beyond the wall. Good, they are ready. Letting loose her bolts into the fringe of the crowded enemy she shouted back, “Get down!” as she continued forward, cutting down one Angmarim, than another. A faint whistling carried through the air. Either Arathier did not hear her or did not care for he continued on, charging into the enemy lines. He hit an orc between the eyes and then unsheathed his sword as he helped her carve a path towards the fire and the hill-man bound above it. Eruviel dashed through the surprised and enraged mob, killing some and dodging around others, her eyes fixed on an Angmarim carrying a shield. Reaching her target she ducked under his attempt to shield-bash her and cut him down. Taking the shield she threw it back to Arathier as he neared her before running and jumping up the burning mound. Arathier snagged the shield and smacks an incoming orc with the front of it, stabbing it in the throat. He then raised it as he stood between Eruviel and the small wave of Angmarim that rushed him. Eruviel could hear the whispered breath of arrows as she frantically tore at the ropes that bound the tall, thickly built man. His wide, pain filled eyes, grew bigger at seeing her. Cutting the ropes that bound him she grit her teeth to steel herself against the rising flames. An arrow fell from the sky and tinked off Eruviel’s shoulder guard. “I will buy you time!” Arathier shouted up at her, stepping forward to parry an attack from the first Angmarim. Nonono! she screamed at him as she finally pulled Daran free. “Shield up!” she yelled frantically after him as she grabbed Daran around the waist and hauled him out of the fire. Tumbling to the ground she landed on top and braced herself above her bloodied and battered friend, biting back the pain of the burns on her hands as the arrows shot from below rained down around them, bouncing off her armour and cutting down the enemy. She couldn’t see Arathier, but not getting shot by their own allies and keeping Daran alive overshadowed her worry. “Well this is one way to be saved,” the man coughed with an attempt at a mischievous smile. “No off-colored jokes,” she replied with a playful glare. “I brought a friend home, brother. Daran arched a brow at her as he moved her like a shield to block an incoming arrow. “If we survive this I’ll–” He left his sentence unfinished as a coughing fit seized him and she could see blood on his hand. A arrow grazed her cheek. “Augh!” she gasped, gritting her teeth and shooting Daran a look that ordered him to keep his concerned look to himself. From below she could hear the gate creak as the hunters broke through. “Can you walk?” Looking up she bit back a cry at seeing Arathier run towards them, blood soaking his pant leg at the thigh.